Based on Espied, Sidespied places the menu toggle button and side panel along the left part of the screen, and shows off larger featured images on the portfolio page. Sidespied uses the Portfolio feature, which lets you lay out and display portfolio projects in a variety of unique ways. Learn how to take full advantage of Portfolios. Large featured images really shine in Sidespied’s portfolios, so try to include featured images at least 1280px wide so they display at full width on wider screens. Featured Images are key to Sidespied’s look-and-feel. They are displayed in multiple places, including archive pages, the portfolio page template, and when using portfolio shortcodes. The [portfolio] shortcode can be used to display portfolio projects on any post or page. Learn how to use the portfolio shortcode. 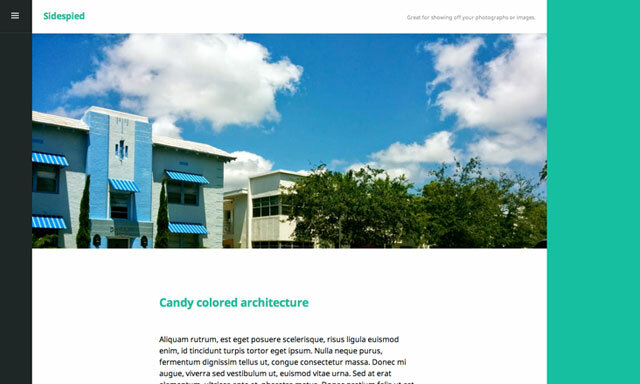 The portfolio page template displays your portfolio projects. You can choose to make it your front page, or keep it as a separate page inside your site. Create or edit a page, and assign it to the Portfolio Page Template from the Page Attributes module. Go to Customize → Static Front Page and set “Front page displays” to “A static page”. Select the page you just assigned the Portfolio Page Template to as “Front page” and set another page as the “Posts page” to display your blog posts. Where is the portfolio archive page? Along with the Portfolio Page Template, projects appear on portfolio archive pages. If you’d like to add the portfolio archive page to your a Custom Menu, create a custom link using the portfolio archive URL. You can customize the portfolio archive page by changing the title, adding some content, and uploading a featured image. To do so, go to Customize → Portfolio. Sidespied lets you to easily link up your social media profiles, like Facebook, Instagram, and Twitter. Linking to any of the following sites will automatically display its icon in your menu. It’s just as easy as that, simply add the URL for the service you’d like to include and this theme does the rest! Sidespied’s widget area can be toggled open and closed from the left-hand side panel. The site menu and social links menu are also tucked away in this spot. Sidespied also works well as a blog theme. It’s easy to add an elegant pull quote for wider screens. Just add the alignleft or alignright class to a blockquote and the quote will subtly offset into the left or right margin. Sidespied supports Post Formats including aside, image, video, quote, link, and gallery. Customize Sidespied with a full-width Custom Header Image or Custom Background, or choose from one of four color palettes. The main column width is 80%. The sidebar width is 100%. Featured Images for blog posts are 1280 wide by unlimited height. Featured Images for portfolio projects are 1280 wide by 480 (landscape), 480 (portrait), and 480 (square) height. Custom header image should be at least 1600 wide.